The Chemizer, available in both pH and ORP models, is an automatic water chemistry monitoring and control system which senses pH or ORP levels and activates a chemical feeding device, constantly maintaining the water chemistry at a precise setting. Applications: Drinking water, swimming pools, cooling towers, industrial processing, waste water treatment, packaged treatment plants. What Makes The Chemizer pH and ORP Different From Other Manufacturers? Simplicity of design, simple to install, easy to understand and operate, and affordable. Transformer power supply: The transformer power supply simply plugs into a 110V AC outlet with GFCI protection. The plug-in transformer eliminates the need to "hot wire" into the timer box. Printed circuit board: The printed circuit board is potted and then sealed in a wall- mountable plastic box, protecting the electronics from moisture and corrosion. NEMA rated enclosure can be installed outdoors. Controller: Control unit has no dials or confusing switches on the controller face. The pH control unit has factory adjusted set points while the ORP set points are adjusted by turning an internal screw on right side of unit. This eliminates pump room errors! Plug in options: Options for connecting feeders, alarms, and chart recorders simplify installation. All input and output current to the controller is safe, low voltage DC. What is ORP? Is it affected by pH? As the chlorine/sanitizer dissipates, the ORP-mV level will go down, indicating that the sanitizer is not as effective. Bringing the pH down or adding more sanitizer will raise the millivolt reading, the higher ORP reading, the more sanitizer that is in the water. That is why most ORP instruments also incorporate an electronic pH meter - which measures the difference in electrical potential between the water and a sample of known pH contained in a small glass bulb. (The Chemizer pH has a preset pH range of 7.4 - 7.6). Why is the Chemizer better than constant feeder devices? 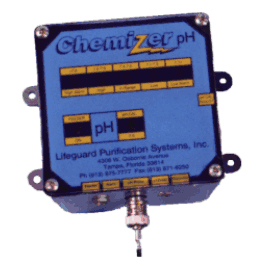 The Chemizer assures that you will monitor and maintain the water chemistry within your requirements by assuring that the sanitizer and pH adjusting chemicals will be used precisely as they are needed, eliminating the peaks and valleys in sanitizer residual and pH that often occur with constant feeder devices as contaminant load fluctuates. Why use the Chemizer pH and ORP chemical controller? By eliminating the peaks and valleys of over and under chlorinating, chemical waste is prevented. This results in an average chemical savings of up to 40%. Maintenance personnel's work schedule is uninterrupted. Accurate, secure control even at night and on weekends. Filter runs are increased reducing back-washing waste. Strong, offensive chlorine odors are greatly reduced. Reduces scaling and corrosion on the heat exchangers and fixtures. The affordable Chemizer is easy to justify!